If It's Too Loud...: Sauna Youth - "Transmitters"
Sauna Youth are one of those bands where you kinda already know what they'll sound like before you even hear them, and if "Transmitters" is any indication, you'd be right. Sauna Youth is obviously a play on Sonic Youth, so they'll obviously be noisy. But it's also a fairly silly name, so they need to have some sense of fun. They formed in Brighton back in 2009, moving to London and forming their current line up in 2011. They released their debut album, Dreamlands, back in 2012. Since then, all four members have also performed as Monotony, and next month their sophomore release as Sauna Youth, Distractions, comes out. Distractions comes out June 8 on Upset the Rhythm. 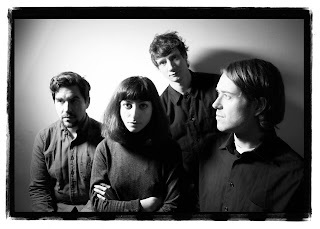 For more information on Sauna Youth, you can like them on Facebook and check out their Bandcamp.